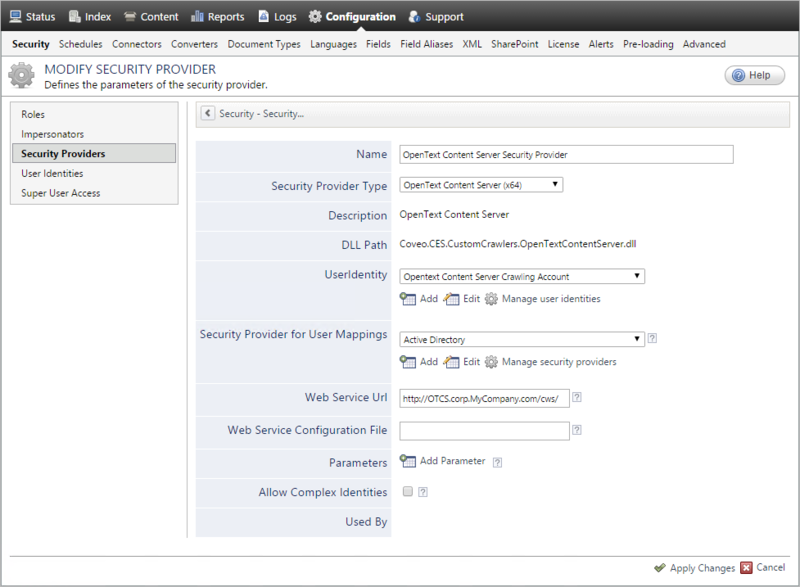 The Coveo connector needs a security provider to be able to get the permissions for each indexed OpenText Content Server (OTCS) item, and therefore fully support the OTCS security model. This means that, in a Coveo search interface, a user searching for OTCS content only sees the content to which he has access in OTCS. In the Security page, in the navigation panel on the left, click Security Providers. In the Name box, enter a name to identify this security provider. Note: You can also use the OTCS connector to crawl a Livelink version 9.7.1 source. You need to add a hidden parameter to do so (see below). In the Security Provider Type drop-down list, select OpenText Content Server (x64). In the drop-down list, select the user identity that you selected or created previously. When needed, click Add, Edit, or Manage user identities respectively to create, modify, or manage user identities. CES 7.0.5556+ (June 2013) In the Security Provider for User Mappings drop-down list, select the security provider that will receive the login names of the users and perform the mapping to OTCS users. Example: When Microsoft Windows users perform a search, select an Active Directory security provider to map AD users to OTCS users. where you replace OTCS_Server by the fully qualified domain name of your server. Important: CES 7.0.8225+ (March 2016) (For OTCS 10.5+ only) Replace les-services by cws. Note: You will also need to specify this URL in the Web Service URL parameter when you configure your source (see Configuring and Indexing an OpenText Content Server Source). In the Web Service Configuration File box, in rare cases where the security provider encounters communication issues with Windows Communication Foundation (WCF), you can modify the way in which the security provider communicates with OTCS by entering the path and file name of a custom configuration file (see the Microsoft document Configuring Services Using Configuration Files). Next to Parameters, click Add Parameter when you want to show and use advanced source parameters (see Modifying Hidden OpenText Content Server Source Parameters). Important: CES 7.0.5425+ (May 2013) When you are indexing a Livelink v9.7.1, you must add the OTCSVersion parameter and enter the 9.7.1 value. Leave the Allow Complex Identities option cleared as it does not apply to this type of security provider. Configure and index an OTCS source (see Configuring and Indexing an OpenText Content Server Source).